This short article on the weak housing market has big implications for "big broadband," which few of us have right now. A major economist is predicting that the housing market may not recover for years, but coupled with high gas prices, walkable communities will be in high demand. This has significant implications for city and community planners, but it is extremely difficult to ensure that everyone, or even a majority of workers, can walk to work. A better option would be to get "big broadband" to most homes so that more workers can work from home. Even the ability to work productively from home one or two days a week could cut the cost of commuting by 20% to 40%...nothing to sneeze at when gas is $4 a gallon. Walmart has announced a partnership with Vudu. You can take your DVDs and Blu-ray movie discs to Walmart, and pay $2 to have them "converted" and stored in the cloud. If you want an HD (Blu-ray) version, you pay $5. Walmart does not actually read your discs; instead, they verify that you actually have a physical copy, then just enable that movie for your account from a previously stored digital master. Walmart also apparently stamps your physical disk with some mark so that you can just give it to a friend who takes it in a week later. The Walmart/Vudu site has remarkably little information; you have to create a Vudu account to figure out how it works and what the restrictions are. 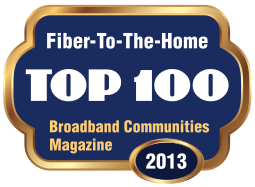 Of course, if you want to stream your HD movies from the cloud, you better have good broadband at your house. We have not seen this rotary trenching machine in action, but this short video illustrates that you don't have to spend a lot of time and money installing fiber drops--this machine looks like it is ideally suited for "last mile" (first mile) residential fiber installation. This pull-along machine is lightweight, can be carried in a van or pickup, is narrow enough to go through typical fence gates, and cuts a 7" deep slot for a fiber drop cable. "iPads could clog 4G networks" Wait...what? So on the one hand, the new 4G networks are going to solve all our bandwidth problems without any of those pesky fiber cables running everywhere. On the other hand, Apple roles out a new tablet device, and the very same super fast networks are likely to collapse under the strain. Somebody needs to get their story straight. But read the whole article, as it provides a good explanation of why wireless is not going to solve our bandwidth problems. We need wireless for mobility access, but it cannot and will not replace the need for fiber at home and at work. "My DSL is worthless on the weekends...."
"My DSL is worthless on the weekends." Exact quote from someone I talked to yesterday. She lives in a rural part of Virginia, and DSL is her only broadband option. So many people are now routinely streaming bandwidth intensive video content that the local DSL Access Module (DSLAM) is overloaded and can't handle the demand. The local incumbent has a monopoly on broadband service, so there is no incentive to spend more to improve the backhaul from the DSL switch down the road from her house. Her service is better on weekdays because most of her neighbors travel to school or work during the day, and she does much of her work FROM HOME. But as the price of gas climbs past $5/gallon, living in a rural area and commuting long distances to work is going to become a luxury of the wealthy unless the bandwidth is there in rural communities and back roads to allow some folks to work from home. The rapidly rising cost of gasoline and the just as rapidly increasing demand for bandwidth on antiquated copper-based networks is about to create a perfect storm in rural communities that don't have a strategy for increasing the affordability and performance of broadband. The popular Broadband Communities Summit (April 24-26, Dallas, Texas) has an extensive track of speakers and sessions devoted entirely to open access and community broadband networks. Right now the conference is running an early bird registration special. A list of the Open Access sessions are below. Open-access networks are built to support multiple providers that offer dozens or even hundreds of services. Instead of collecting revenue for two or three mostly low-margin services, network operators can accrue revenue directly or indirectly from every service offered to customers on the network. Though most of these will be niche services, many have high profit margins. This session will discuss key differences in open-access network architecture, introduce alternative business models and show how those business models can create attractive opportunities for service providers. A community’s rights of way constitute a valuable asset that it can use for economic development and revenue enhancement. Too often, city officials manage this asset in a reactive way, simply responding to requests from telecom providers and other utilities for right-of-way use. Find out how leading-edge communities proactively plan and manage right-of-way usage in order to attract ultra-broadband providers, encourage economic development and fully exploit their assets. The first open-access networks in the U.S. were launched into uncharted waters – no one knew whether or how they would work from a business or technical standpoint. Those starting out today can benefit from the experiences of the pioneers and choose strategies that have been proven successful. Though most fiber-to-the-premises networks can be configured to support multiple service providers, there are preferred ways to design networks specifically for open access. Learn about new technologies for all aspects of deployment and operation – ranging from conduits to optoelectronic equipment to solutions for network management and provisioning – that have been specifically designed to make open-access fiber networks cost-effective, manageable and easy to implement. Many of the middle-mile fiber networks being constructed today are open to multiple providers - some of them, though by no means all, because of requirements imposed by government funding. In this session, deployers and operators of middle-mile networks will share what they have learned, from both a technical and business standpoint, about making open access work in the middle mile. Rural communities that have been bypassed by both private and public broadband programs are left to their own devices when it comes to obtaining broadband. Some are now proving adept at what might be termed do-it-yourself or “crowd-sourced” broadband strategies. This session will present case studies of rural coalitions – ECFiber in Vermont and B4RN in northern England – that rely heavily on local resources to raise capital, organize projects and even deploy fiber. Can these new models make FTTH practical and affordable in rural settings? Apple's stock price is $494 at 2 PM today. Apple is now worth more than Microsoft and Google combined. Notice that they are saying a single channel of live HD requires AT LEAST 5 Meg of bandwidth. Roku does not say, "...up to 5 Meg," or "...5 meg when no one else in the neighborhood is sucking all the bandwidth down watching a movie." They are saying, "...if you want to watch live events in HD, you need 5 meg of bandwidth per stream." By per stream, that means if two of you in your home are watching two different live events, you need 5 Meg x 2 = 10 Meg of bandwidth. That will never happen over DSL, and even on cable networks where they are now advertising wildly inflated bandwidth promises ("...up to 15 meg with SuperIncredibleGinormousCableBoost technology...."), just a few people trying to watch an HD broadcast in the same neighborhood are going to slow things to a crawl. It's worse for business. The ever-increasing cost of travel, coupled with much improved technology is pushing videoconferencing quickly into a "must have" business requirement. Our videoconferences with clients here at Design Nine often includes four different people in four different locations. Using the Roku standard for picture quality, each location would need 4 x 5 Meg = 20 Meg of bandwidth...at each location. Just for a routine business meeting. Within ten years, 90% of the homes and businesses in America will have fiber, and much of it will NOT be supplied from the incumbent telephone and cable companies. NY Times: "The New Digital Divide"
The New York Times has an excellent article on the now almost two decades old digital divide problem. Where the digital divide was once "who has dial up access and who doesn't," it is now "who has real high speed access and who doesn't?" "...it is hard to get a college degree from a remote location using wireless. Few people would start a business using only a wireless connection." Fiber is the long term technology solution for both wired business and residential access as well as improved wireless and mobility access; what everyone forgets is that wireless networks have to move data and voice traffic onto the wired network, and robust open access fiber networks make wireless networks work better and makes wireless less expensive..
Muni Networks has an excellent weekly email that summarizes their coverage of community broadband issues during the week. There is a link up on the right hand top of the home page to subscribe. If you look at the jobs report released today, it underscores what I have been saying for a decade: neighborhoods are the new business district. CNBC summarizes the September jobs data; the manufacturing sector LOST jobs, but if you go to the household survey, job creation was in the black (modestly). What does this mean? It means more people are working from home, and that means they need business class broadband, not an "entertainment service," as my cable company quaintly calls our home Internet service. Neighborhoods are business districts, and business districts need competitive and affordable telecom service options. Death of TV: Part XXXII -- "Okay"
True story. I discussed the possibility of eliminating our family cable TV subscription and just sticking with Internet. The response was, and I quote exactly, "Okay. Can we get Hulu Plus?" That's the state of cable TV today. It doesn't even merit a 30 second discussion of its value.